My favorite new abstract ! Lovely, simply lovely. I'm in awe. Please teach me how you did this. Here is an answer... as most of the work is made of experience I just stop when I'm happy with a result. And most of the time I can't remember the path that lead to it. So this is only a guide to process and you must fill free to use other effects or settings to create your own abstract art. I won't tell you to hide/show the layers but I hope you'll be able to do it by yourself. As well the pictures are only details to fit in the 800x600 dimensions (or 600x800). 01. 🆕 create a new large image (4000x3000). 02. :Plugins: With this settings run a perlin texture to obtain a wavy colorful rainbow. Don't forget to set the orientation to Switched. 03. :DuplicateLayer: Duplicate the layer. 04. :Plugins: On the top layer run a Tiles reflection XY with this settings. 05. :Plugins: Then run the Seamless texture maker with the default settings. 06. :Plugins: This is (what I call) the secret #2 of Shape3D. It creates a distortion of the image. So use the following settings to obatin the same effect. 07. :DuplicateLayer: Duplicate the bottom layer. Then :MoveLayerUp: move the new layer on the top of the list. 08. :Plugins: Again with shape3d, this is (what I call) the secret #1 of Shape3D. It creates a spheric distortion of the image. So use the following settings to obatin the same result. 09. :DuplicateLayer: Duplicate the top layer and :FlipHorizontal: flip it Horizontaly. :SaveAs: As you've finished the first half of this tut, it's a good idea to save your work now (if it isn't done yet). 12. :MergeLayerDown: Merge down the 3 top layers : to keep the cascading blend mode, start with the second from the top, then the top layer. Optionaly you could adjust the color with autolevel. 13. :DuplicateLayer: Duplicate the top layer and repeat the last effect Ctrl+F it was shape3D. 14. :Plugins: You could flip the colors using the color flip plugin as we started with some random kind of color it could be interesting to change that. 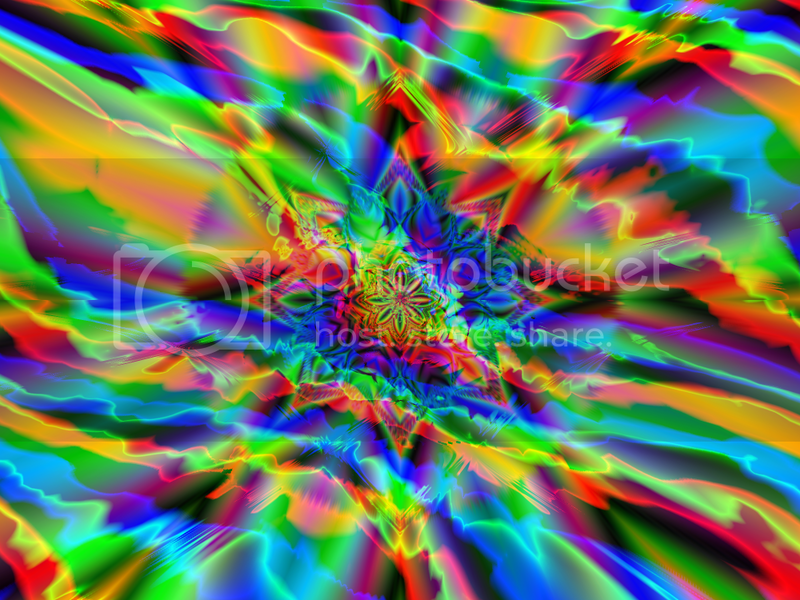 15. :Plugins: Use the kaleidoscope to create some beautiful image. Test the piece selector with different values. 16. :DuplicateLayer: Duplicate the top layer and :Plugins: do a Polar transformation with the default values. 17. Still on the first layer from the top, :Plugins: run the Shape3D with previuos settings except Texture map to Full Cylinder map and texture rotation to 90°. 18. On the second layer from the top, :Plugins: run the Shape3D with previuos settings except texture rotation back to 0°. 19. On the top layer, press F4 :LayerProperties:, choose a blend mode (Darken). 20. On the second layer from the top, press F4 :LayerProperties:, choose a blend mode (Lighten). 21. On the third layer from the top, press F4 :LayerProperties:, choose a blend mode (Glow). 23. :Resize: Optionaly you could resize to a usable size like 1600x1200 with best quality resampling. Thanks so much for sharing Madjik. Book marked for later. Hey, MadJik, I rarely visit the forums these days, but when I read through your tutorial, I accidentally made this while struggling to make something. I created my own texture, and used a bit of your tutorial to create the abstract pattern. This is my attempt.I think I got carried away a wee bit,but I just loved the colours.Great tutorial it has really opened my eyes and my mind.Secrets 1 and 2 saved in XML.Thank you very much for sharing. To obtain a WYSIWYG you have to start from the lowest layer... or flatten the image. Ha,Ha,Ha, sorry, I am a bit slow sometimes. I totally understand the cascade merging of layers.I went wrong at the polar transformation step and got my layers mixed up.One and a half hours later I saw what I was doing wrong.Now I am kicking myself.Still,all great fun. Bookmarked and made several works.